In signal processing, independent component analysis (ICA) is a computational method for separating a multivariate signal into additive subcomponents. This is done by assuming that the subcomponents are non-Gaussian signals and that they are statistically independent from each other. ICA is a special case of blind source separation. A common example application is the "cocktail party problem" of listening in on one person's speech in a noisy room. Independent component analysis attempts to decompose a multivariate signal into independent non-Gaussian signals. As an example, sound is usually a signal that is composed of the numerical addition, at each time t, of signals from several sources. The question then is whether it is possible to separate these contributing sources from the observed total signal. When the statistical independence assumption is correct, blind ICA separation of a mixed signal gives very good results. It is also used for signals that are not supposed to be generated by mixing for analysis purposes. A simple application of ICA is the "cocktail party problem", where the underlying speech signals are separated from a sample data consisting of people talking simultaneously in a room. Usually the problem is simplified by assuming no time delays or echoes. Note that a filtered and delayed signal is a copy of a dependent component, and thus the statistical independence assumption is not violated. The source signals are independent of each other. The values in each source signal have non-Gaussian distributions. Independence: As per assumption 1, the source signals are independent; however, their signal mixtures are not. This is because the signal mixtures share the same source signals. Normality: According to the Central Limit Theorem, the distribution of a sum of independent random variables with finite variance tends towards a Gaussian distribution. Loosely speaking, a sum of two independent random variables usually has a distribution that is closer to Gaussian than any of the two original variables. Here we consider the value of each signal as the random variable. Complexity: The temporal complexity of any signal mixture is greater than that of its simplest constituent source signal. Those principles contribute to the basic establishment of ICA. If the signals we happen to extract from a set of mixtures are independent like sources signals, and have non-Gaussian histograms or have low complexity like source signals, then they must be source signals. The Minimization-of-Mutual information (MMI) family of ICA algorithms uses measures like Kullback-Leibler Divergence and maximum entropy. The non-Gaussianity family of ICA algorithms, motivated by the central limit theorem, uses kurtosis and negentropy. Typical algorithms for ICA use centering (subtract the mean to create a zero mean signal), whitening (usually with the eigenvalue decomposition), and dimensionality reduction as preprocessing steps in order to simplify and reduce the complexity of the problem for the actual iterative algorithm. Whitening and dimension reduction can be achieved with principal component analysis or singular value decomposition. Whitening ensures that all dimensions are treated equally a priori before the algorithm is run. Well-known algorithms for ICA include infomax, FastICA, JADE, and kernel-independent component analysis, among others. In general, ICA cannot identify the actual number of source signals, a uniquely correct ordering of the source signals, nor the proper scaling (including sign) of the source signals. ICA is important to blind signal separation and has many practical applications. It is closely related to (or even a special case of) the search for a factorial code of the data, i.e., a new vector-valued representation of each data vector such that it gets uniquely encoded by the resulting code vector (loss-free coding), but the code components are statistically independent. Linear independent component analysis can be divided into noiseless and noisy cases, where noiseless ICA is a special case of noisy ICA. Nonlinear ICA should be considered as a separate case. or minimizes the mutual information. In some cases, a priori knowledge of the probability distributions of the sources can be used in the cost function. , the task is overcomplete but is still solvable with the pseudo inverse. must be of full rank for its inverse to exist. A special variant of ICA is binary ICA in which both signal sources and monitors are in binary form and observations from monitors are disjunctive mixtures of binary independent sources. The problem was shown to have applications in many domains including medical diagnosis, multi-cluster assignment, network tomography and internet resource management. is Boolean OR. Note that noise is not explicitly modelled, rather, can be treated as independent sources. to obtain the binary values. This approach has been shown to produce a highly inaccurate result. -th monitor. Experimental results from  show that this approach is accurate under moderate noise levels. The Generalized Binary ICA framework  introduces a broader problem formulation which does not necessitate any knowledge on the generative model. In other words, this method attempts to decompose a source into its independent components (as much as possible, and without losing any information) with no prior assumption on the way it was generated. Although this problem appears quite complex, it can be accurately solved with a branch and bound search tree algorithm or tightly upper bounded with a single multiplication of a matrix with a vector. Signal mixtures tend to have Gaussian probability density functions, and source signals tend to have non-Gaussian probability density functions. Each source signal can be extracted from a set of signal mixtures by taking the inner product of a weight vector and those signal mixtures where this inner product provides an orthogonal projection of the signal mixtures. The remaining challenge is finding such a weight vector. One type of method for doing so is projection pursuit. Projection pursuit seeks one projection at a time such that the extracted signal is as non-Gaussian as possible. This contrasts with ICA, which typically extracts M signals simultaneously from M signal mixtures, which requires estimating a M × M unmixing matrix. One practical advantage of projection pursuit over ICA is that fewer than M signals can be extracted if required, where each source signal is extracted from M signal mixtures using an M-element weight vector. We can use kurtosis to recover the multiple source signal by finding the correct weight vectors with the use of projection pursuit. , and ensures that the measured kurtosis takes account of signal variance. The goal of projection pursuit is to maximize the kurtosis, and make the extracted signal as non-normal as possible. For multiple source mixture signals, we can use kurtosis and Gram-Schmidt Orthogonalization (GSO) to recover the signals. Given M signal mixtures in an M-dimensional space, GSO project these data points onto an (M-1)-dimensional space by using the weight vector. We can guarantee the independence of the extracted signals with the use of GSO. Another approach is using negentropy instead of kurtosis. Negentropy is a robust method for kurtosis, as kurtosis is very sensitive to outliers. The negentropy method are based on an important property of Gaussian distribution: a Gaussian variable has the largest entropy among all continuous random variables of equal variance. This is also the reason why we want to find the most nongaussian variables. A simple proof can be found in Differential entropy. A proof can be found on page 131 in the book Independent Component Analysis written by Aapo Hyvärinen, Juha Karhunen, and Erkki Oja (They contribute great works to ICA) This approximation also suffers the same problem as kurtosis (sensitive to outliers). Other approaches were developed. ICA is essentially a multivariate, parallel version of projection pursuit. Whereas projection pursuit extracts a series of signals one at a time from a set of M signal mixtures, ICA extracts M signals in parallel. This tends to make ICA more robust than projection pursuit. The projection pursuit method uses Gram-Schmidt orthogonalization to ensure the independence of the extracted signal, while ICA use infomax and maximum likelihood estimate to ensure the independence of the extracted signal. The Non-Normality of the extracted signal is achieved by assigning an appropriate model, or prior, for the signal.
. For this reason, using entropy to extract independent signals is known as infomax. to achieve the independence of extracted signal. , and make the extracted signals independent and non-gaussian. Like the projection pursuit situation, we can use gradient descent method to find the optimal solution of the unmixing matrix. is far from the correct parameter values then a low probability of the observed data would be expected.
) the likelihood of the model parameter values given the observed data.
. The unmixing matrix that maximizes equation is known as the MLE of the optimal unmixing matrix. that maximizes this function is the maximum likelihood estimation. The early general framework for independent component analysis was introduced by Jeanny Hérault and Bernard Ans from 1984, then rejoined by Christian Jutten from 1985 and was most clearly stated by Pierre Comon in 1994. In 1995, Tony Bell and Terry Sejnowski introduced a fast and efficient ICA algorithm based on infomax, a principle introduced by Ralph Linsker in 1987. There are many algorithms available in the literature which do ICA. A largely used one, including in industrial applications, is the FastICA algorithm, developed by Aapo Hyvärinen and Erkki Oja, which uses the kurtosis as cost function. Other examples are rather related to blind source separation where a more general approach is used. For example, one can drop the independence assumption and separate mutually correlated signals, thus, statistically "dependent" signals. Sepp Hochreiter and Jürgen Schmidhuber showed how to obtain non-linear ICA or source separation as a by-product of regularization (1999). Their method does not require a priori knowledge about the number of independent sources. ICA can be extended to analyze non-physical signals. For instance, ICA has been applied to discover discussion topics on a bag of news list archives. 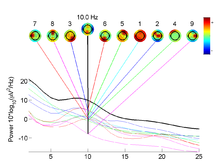 removing artifacts, such as eye blinks, from EEG data. analysis of changes in gene expression over time in single cell RNA-sequencing experiments. studies of the resting state network of the brain. ^ Isomura, Takuya; Toyoizumi, Taro (2016). "A local learning rule for independent component analysis". Scientific Reports. 6: 28073. doi:10.1038/srep28073. PMC 4914970. PMID 27323661. ^ a b Stone, James V. (2004). Independent component analysis : a tutorial introduction. Cambridge, Massachusetts: MIT Press. ISBN 978-0-262-69315-8. ^ Hyvärinen, Aapo; Karhunen, Juha; Oja, Erkki (2001). Independent component analysis (1st ed.). New York: John Wiley & Sons. ISBN 978-0-471-22131-9. ^ Painsky, Amichai; Rosset, Saharon; Feder, Meir (2014). Generalized Binary Independent Component Analysis. IEEE International Symposium on Information Theory (ISIT), 2014. pp. 1326–1330. doi:10.1109/ISIT.2014.6875048. ISBN 978-1-4799-5186-4. ^ Hyvärinen, Aapo; Erkki Oja (2000). "Independent Component Analysis:Algorithms and Applications". Neural Networks. 4-5. 13 (4–5): 411–430. CiteSeerX 10.1.1.79.7003. doi:10.1016/s0893-6080(00)00026-5. PMID 10946390. ^ Hyvärinen, Aapo; Karhunen, Juha; Oja, Erkki (2001). Independent component analysis (Reprint ed.). New York, NY: Wiley. ISBN 978-0-471-40540-5. ^ Hyvärinen, Aapo (1998). "New approximations of differential entropy for independent component analysis and projection pursuit". Advances in Neural Information Processing Systems. 10: 273–279. ^ Hérault, J.; Ans, B. (1984). "Réseau de neurones à synapses modifiables : Décodage de messages sensoriels composites par apprentissage non supervisé et permanent". Comptes Rendus de l'Académie des Sciences, Série III. 299: 525–528. ^ Ans, B., Hérault, J., & Jutten, C. (1985). Architectures neuromimétiques adaptatives : Détection de primitives. Cognitiva 85 (Vol. 2, pp. 593-597). Paris: CESTA. ^ Hérault, J., Jutten, C., & Ans, B. (1985). 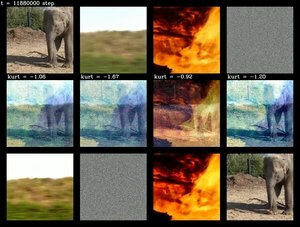 Détection de grandeurs primitives dans un message composite par une architecture de calcul neuromimétique en apprentissage non supervisé. Proceedings of the 10th Workshop Traitement du signal et ses applications (Vol. 2, pp. 1017-1022). Nice (France): GRETSI. ^ Hérault, J., & Jutten, C. (1986). Space or time adaptive signal processing by neural networks models. Intern. Conf. on Neural Networks for Computing (pp. 206-211). Snowbird (Utah, USA). ^ Hochreiter, Sepp; Schmidhuber, Jürgen (1999). "Feature Extraction Through LOCOCODE" (PDF). Neural Computation. 11 (3): 679–714. doi:10.1162/089976699300016629. ISSN 0899-7667. PMID 10085426. Retrieved 24 February 2018. ^ Brown, GD; Yamada,S; Sejnowski, TJ (2001). "Independent components analysis at the neural cocktail party". Trends in Neurosciences. 24 (1): 54–63. doi:10.1016/s0166-2236(00)01683-0. PMID 11163888. ^ Lewicki, MS (1998). "Areview of methods for spike sorting: detection and classification of neural action potentials". Network: Computation in Neural Systems. 9 (4): 53–78. doi:10.1088/0954-898X_9_4_001. ^ Barlett, MS (2001). Face image analysis by unsupervised learning. Boston: Kluwer International Series on Engineering and Computer Science. ^ Bell, AJ; Sejnowski, TJ (1997). "The independent components of natural scenes are edge filters". Vision Research. 37 (23): 3327–3338. doi:10.1016/s0042-6989(97)00121-1. PMC 2882863. PMID 9425547. ^ Back, AD; Weigend, AS (1997). "A first application of independent component analysis to extracting structure from stock returns". International Journal of Neural Systems. 8 (4): 473–484. doi:10.1142/s0129065797000458. PMID 9730022. ^ Hyvarinen, A, Karhunen,J & Oja,E (2001a). Independent component analysis. New York: John Wiley and Sons. ^ Polder, G; van der Heijen, FWAM (2003). "Estimation of compound distribution in spectral images of tomatoes using independent component analysis". Austrian Computer Society: 57–64. ^ Delorme, A; Sejnowski, T; Makeig, S (2007). "Enhanced detection of artifacts in EEG data using higher-order statistics and independent component analysis". NeuroImage. 34 (4): 1443–1449. doi:10.1016/j.neuroimage.2006.11.004. PMC 2895624. PMID 17188898. ^ Trapnell, C; Cacchiarelli, D; Grimsby, J (2014). "The dynamics and regulators of cell fate decisions are revealed by pseudotemporal ordering of single cells". Nature Biotechnology. 32 (4): 381–386. doi:10.1038/nbt.2859. PMC 4122333. PMID 24658644. ^ Kiviniemi, Vesa J.; Kantola, Juha-Heikki; Jauhiainen, Jukka; Hyvärinen, Aapo; Tervonen, Osmo (2003). "Independent component analysis of nondeterministic fMRI signal sources". NeuroImage. 19 (2): 253–260. doi:10.1016/S1053-8119(03)00097-1. PMID 12814576. MELODIC, part of the FMRIB Software Library.